On this page you can see the photos of kids leather sandals and kids boots designed and made by my Dad Lermont Moukoian for us, his children, when we were little. 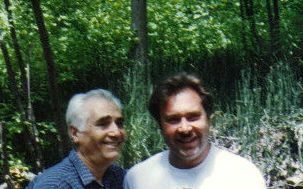 It's my Dad Lermont and my brother in the photo on the right hand side. Interestingly, neither one of my brothers followed my Dad's footsteps to become a specialist cobbler. One of my brothers is an auto mechanic, and the other is a skydiver. And all three are really good at what they do! My two brothers and I always wore shoes designed and made by my Dad Lermont from the time that we took our first baby steps until we moved to the United States in the 1970's. As we were growing up in Yerevan, Armenia, all our school friends and all the children in our neighborhood were envious and even jealous of us because our shoes always stood out and looked much nicer than theirs. We received a lot of compliments from total strangers in all kinds of public places. They would ask us where our parents bought our shoes from. The above photo of my Dad and my brother is taken in the mountains of Salt Lake City, Utah. We went for a picnic that day. My brother and his wife were expecting their second son. In the photos below you can see my two brothers and me wearing kids leather sandals and kids boots. 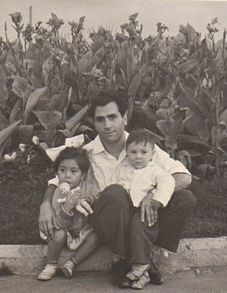 Here, in the photo on the left hand side, is our Dad Lermont holding my brother and me. Our Mom was taking the photo. We were on a summer vacation in Kislovodsk, Russia. 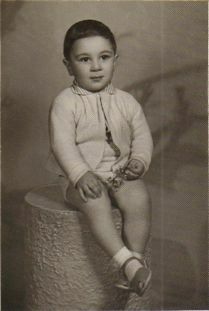 My brother was only one year old, and I was three. I know the photo is not very clear and it's in black and white, but you can still see the kids leather sandals that we were wearing. As usual, our Dad Lermont designed and made these kids leather sandals for us. In the photo on the right hand side, you can see my brother Albert wearing kids boots. I remember how my Dad designed, cut the pattern, and made these tiny kids boots. Albert was only one year old at the time. The photo is taken in Yerevan, Armenia. The photographer gave Albert a toy which he's holding, so he would stop crying. Even though the photo is in black and white, you can see the kids boots that Albert was wearing in the right color. Because these kids booties were made of black and white leather. You can click on Kids Dress Shoes and Kids Leather Sandals to see Albert's shoes that my Dad made for him when he was 3 years old. Amazingly, Albert still has them. 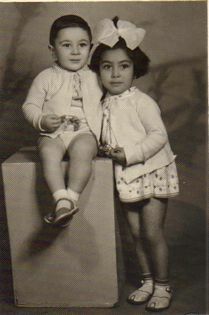 In the photo on the left hand side, you can see my photo when I was two years old proudly wearing girls dress shoes designed and made by my Dad Lermont. I was all dressed up. 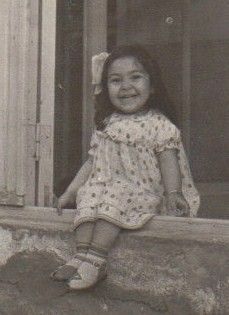 I remember those shoes, the socks and the dress, and even the little jewelry on my left wrist. It's a bangle watch. I don't remember if the watch was real or not. The kids leather sandals that I wore were red and white, my socks were white with red trims, and my dress was white with red, yellow, blue and green polka dots. My Mom put a white hair-ribbon on my hair. My brothers were not even born yet. The older one was going to be born soon. 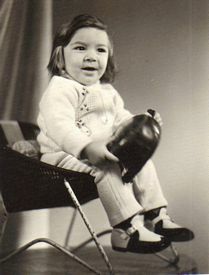 If I had known back then that I was going to grow up and make this website now, I would have asked my Dad to take a close up photo of all the kids leather sandals and boys and girls dress shoes that he made for my brothers and for me. The two photos above were taken the same day in Yerevan, Armenia. My brother was two years old and I was four. We both were wearing kids leather sandals designed and made by our Dad Lermont. In my brother's photo where he's by himself, you can see a little close up of his shoes. Too bad these photos are not in color. However, you can check out my custom shoes designed and made by my Dad Lermont back in the 1970's that I still wear. And these photos are in color. After we moved to the United States he stopped designing and making custom shoes because he got into the shoe repair business and worked in that field for the next 40+ years. The reason that I present all this information is to show you that when it comes to shoe repair, our Dad Lermont is unique because of his special skills and ability of not only designing and making kids dress shoes, children's designer shoes, kids leather sandals, but also men's and women's custom shoes. Let me ask you something. Do you know another shoe repair man who does Leather Book Binding besides shoe repair? My husband Patrick and I don't know anybody else besides my Dad, and neither does anyone else in our family. And because of these special skills and talents, he can handle even the most difficult repair requests that other shoe repairmen usually would refuse. 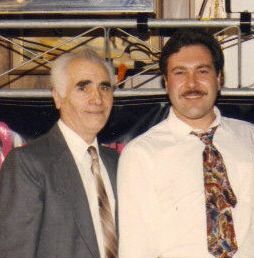 That's why I can tell you with confidence that my Dad Lermont is your #1 shoe repair expert in the Los Angeles area! Don't take my word for it. His customers saw his work for themselves. Once they tried him, they didn't regret it. Not only was he a shoe repair specialist, but he also had the best prices in town. You can read what a few of his customers said about my Dad on the Shoe Repair Expert Home Page. The cross street is Montrose Avenue. It is right off of Freeway 210. His shoe repair shop was convenient to visit if you lived in the Foothill Boulevard area, in Tujunga, La Crescenta, La Canada Flintridge, Pasadena, Verdugo Hills or Glendale. Some of his customers drove all the way from Burbank, Van Nuys, Hollywood, West Los Angeles and Beverly Hills. After visiting him, the majority of his customers agreed with me that Lermont was your #1 shoe repair expert in the Los Angeles area.